Groupon CEO Andrew Mason deflected questions about IPO plans at this week's D9 tech conference. NEW YORK (CNNMoney) -- What do fire dancing classes, gorilla suits, and the unholy sounding "Grouspawn" have in common? They're various quirks touted in Groupon's IPO filing, which offers a lively spin on a usually dry set of regulatory documents. Groupon's founder Andrew Mason opens the filing with a letter addressed to "potential stockholders" sharing his business philosophy: "Life is too short to be a boring company." Writing about the roller-coaster ride his company has been on since launching three years ago, Mason warns that Groupon's path will have "twists and turns, moments of brilliance and other moments of sheer stupidity." The company may make financial sacrifices in pursuit of "ambitious bets on our future that distract us from our current business." It's a letter reminiscent of the "owner's manual" Google (GOOG, Fortune 500) included in its IPO filing back in 2004. Co-founders Larry Page and Sergey Brin cautioned shareholders that they would manage for the long haul, not the short term, and shared their now-famous "Don't be evil" mission. "We aspire to make Google an institution that makes the world a better place," they wrote. The filing's playful touches included its unusual maximum offering price: $2,718,281,828, a multiple of the mathematical constant e. It's a number that's irrational -- and transcendental. 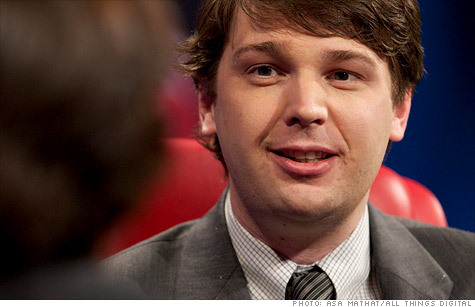 Groupon's 31-year-old founder threaded similar whimsy throughout his company's filing. Groupon's goal is to "create experiences for our customers that make today different enough from yesterday to justify getting out of bed," he wrote. Exhibit A: Grouspawn, described in the filing as "a foundation we created that awards college scholarships to babies whose parents used a Groupon on their first date." It has a website helpfully illustrating how Groupon members can get from step one ("fertilize") to step 3, "get rich off child." It's in keeping with the irreverent tone Mason has always set for Groupon. The company joked about raising like, a billion dollars in its official announcement of one of the largest financing rounds in tech-industry history, and responded to a lawsuit with a blog post joking about high-school gossip and a cabbage-patch doll heisted by one of Mason's former classmates. - Groupon's chief technology officer, Ken Pelletier, followed ex-President Rob Solomon out the door. He left the company on March 23, one day after Solomon's departure. - Solomon's successor, former Google executive Margo Georgiadis, is Groupon's highest-paid executive officer, with a base annual salary of $500,000 -- significantly more than the $575 a year Mason currently collects. She is also eligible for a $500,000 annual bonus, but the big money will come on the back-end: Georgiadis was granted 1.1 million restrict stock shares that will vest over the next five years. Groupon immediately vested 300,000 of the shares. - Most of the $1 billion Groupon raised last year went to cash out company executives and early investors, who sold off some of their holdings for $31.59 per share. Andrew Mason collected $10 million from the sale, and ex-CTO Pelletier took home $8 million. Funds controlled by co-founder Eric Lefkofsky cashed out a whopping $319 million.